It was a crazy busy weekend around these parts! With lots of celebrating all surrounding the number 50...on Friday we celebrated my parents' 50th Wedding Anniversary with a lovely dinner party, and on Saturday we attended a surprise 50th birthday party for my cute sister-in-law! My two sweet sisters and I planned the 50th Celebration for my parents. It was lovely. I was in charge of the main table centerpiece. We had chosen cream table linens, and I had originally planned on going with yellow flowers to bring in the "gold" for the golden anniversary. But, in all honesty, once I was looking at flowers, everything that was available was too sunshine-y yellow, and they just didn't seem elegant enough for the occasion. So I chose white. And the arrangements I created (photographed at my house rather than the venue - hence no table linens) were simple but elegant. 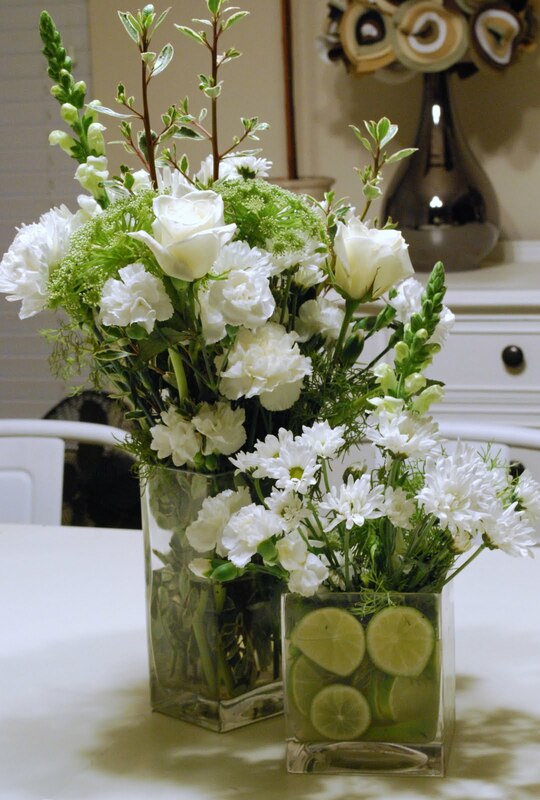 To add interest to the smaller of the two arrangements, I simply cut up a few limes and filled the vase with them before adding the flowers - they also work well as sort of natural floral "frog" to hold the flowers in place. The green of the limes echoed the greenery in the flowers and the entire arrangement was simply elegant. The same idea works great with more casual floral arrangements. Picture lemons and daffodils or daisies in a mason jar. So next time you need a unique floral arrangement think citrus! Hi Wendy! Your arrangements are gorgeous and I'm sure everyone was thrilled seeing these! So pretty! 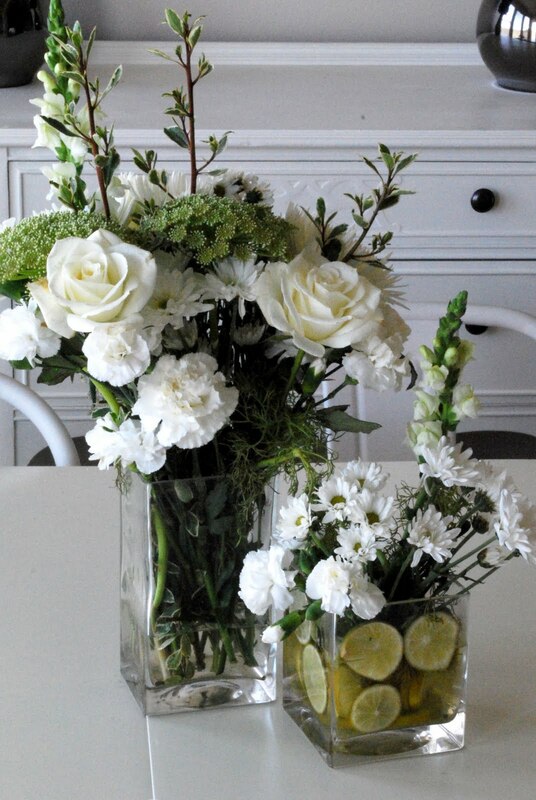 Great combination white flowers and fresh lemons! Wonderful idea! As always, thanks for sharing! Beautiful! Love the addition of the limes! I know everyone had fun at the 5 0 parties!! Beautiful! I love the added detail with the limes! Pretty arrangements!! Did you use a combination of fresh and silk? 50th celebrations are so much fun!! The flowers are beautiful. I learned about a study that stated that if you wake up to plants that you find pleasing, your health and mood can drastically improve over time! Hi Betsey...actually all the flowers are real. Pretty, aren't they? They look great and the use of lemon and limes is a good idea. I will try that out.